This is the image that should be the last nail in the coffin of the Conservative Party’s election hopes. But the right-wing media will probably work hard to make sure that most people don’t see it. According to the Daily Mirror, it was published on Twitter by the Conservative Party’s official account for Campden Ward, in the London borough of Kensington and Chelsea. 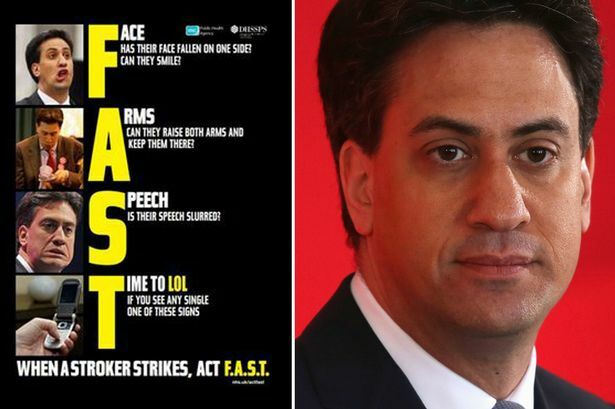 As the Mirror pointed out, the image “mocks the Stroke Association‘s Act FAST poster – illustrating each of the charity’s three signs of a stroke, ‘Face, Arms and Speech’, with a picture of Ed Miliband. The entire Twitter account has since been deleted and the ward’s Facebook page has changed its name to ‘Parks Lnd’. 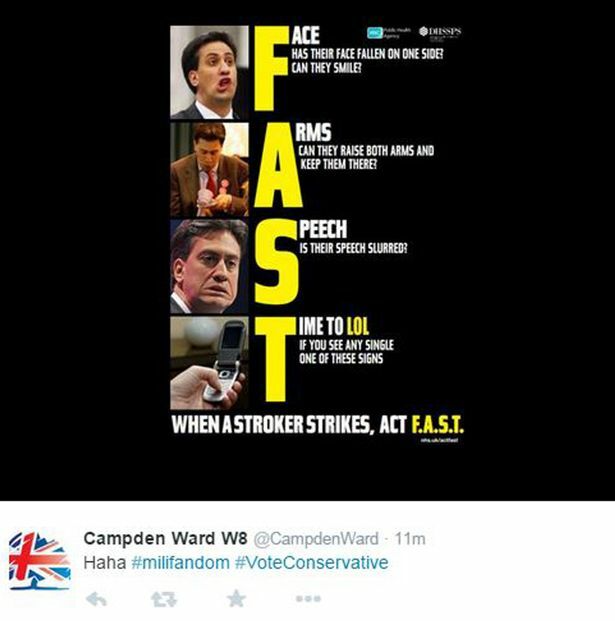 The Mirror report quotes Labour candidate Carrie Wilson, who wrote: “Utterly disgusted at CampdenWard for taking something as serious as a stroke warning to mock someone. Hear, hear. Doesn’t this say everything you need to know about the Conservative Party’s attitude to illness and disability? It’s all a big joke to them! At long last, Conservative policy on sickness benefits is explained. Is this really an organisation that deserves 280 Parliamentary seats after the general election next week? uncovering the rot at the heart of Tory campaigning. The Tories have sung to a new low, I don’t think you could get much lower it’s despicable. The Nasty Party show their natural hatred towards sick and disabled people. Just when you think they can’t sink any lower they plumb the depths. However, this smacks of desperation on their part. The comments attached here are revealing as to the lack of understanding of those who are the real Tory masters, the City and corporations who, having failed within the ‘Global Markets’ are the biggest ‘Welfare’ scroungers in the history of this Nation; all that the Tory filth are doing is implementing their masters wishes, they are ever the vicious scum who hide behind every Psychopath who wants more and more of everything they can get their sweaty claws into…once upon a time it was simply Land –now it is ‘Taxpayers Money’ to fill the gap left from their failed execess’ and, of course, as a by product, to indulge their psychotic brutality…we will never be rid of this ‘Business’ disease until we rout them out and destroy them. “Worse yet, the ensuing debate over the merits of the “free market” versus an activist government has diverted attention from how the market has come to be organized differently from the way it was a half-century ago, why its current organization is failing to deliver the widely shared prosperity it delivered then, and what the basic rules of the market should be. It has allowed America to cling to the meritocratic tautology that individuals are paid what they’re “worth” in the market, without examining the legal and political institutions that define the market. The tautology is easily confused for a moral claim that people deserve what they are paid. Yet this claim has meaning only if the legal and political institutions defining the market are morally justifiable. I have just forwarded it to Stroke Association Media Dept, lets see if they find it funny. F.A.S.T saved my life. Thank you for your email about the CampdenWard misuse of the FAST message. I appreciate how you feel seeing this, as a stroke survivor whose life has been saved by FAST. It is sad and frustrating when stroke is treated as a laughing matter. We completely agree that there is nothing funny about having a stroke and we issued the following statement about this. STATEMENT: the Campden W8 twitter feed misappropriated FAST advertising as part of their political campaigning activity ahead of the 2015 General Election. Patrick Olszowski, Head of Campaigns and Policy at the Stroke Association, said: “A stroke is no laughing matter. It kills more women than breast cancer and more men than prostate cancer, and around 1.2 million people have to live with the devastating consequences of stroke. It is fantastic to hear of the massive impact of FAST for you. Insulting to those who have suffered strokes, personally insulting to Milliband, and generally insulting to all those whose looks do not match those of TV and fashion stereotypes, and mocking an important health message. Don’t judge a book by its cover, you thick and poisonous Tories! Shocking. I hope someone takes them to court for hate crimes. they did the same type of dirty tactics to Mr Brown when he was in power , its the same with the newspapers some of them make continual personal attacks on peoples physical appearance if you are not a conservative, tv media is as bad as well , shame they are not sued for personal libel. What, for exposing the other person to hatred, ridicule or contempt? This sort of activity sadly all too typical of the Tories is reprehensible. Perceived “beauty” should be very, very far down the list of what matters for a potential prime minister. The Tories are playing every dirty trick they can in this election, their attempt to demonise and downgrade the legitimate rights of the SNP to take part in democracy being a good example aided and abetted by their mainstream media allies. Since I first saw this earlier today, I have been posting it in a number of groups on FB. I am happy to say notice is being taken, and there are a lot positive comments being made! Somebody defacing a poster isn’t the same as somebody creating one with offensive remarks built in. As for the Stockton South allegation – I don’t know anything about this. Can you provide factual evidence? I’d say it is pretty much the same, apart from a lack of creativity and vandalising property. Easy to look through the logs on Wikipedia and the allegations regarding Andrew Duffell are present on the internet from multiple sources. Banned from teaching for life for sexual activity with a fourteen year old school boy in a field… A simple search isn’t too difficult, I presume? It helps if I have a name though. Thanks for providing it. Gives you pathetic lefties something to have a good whinge about. Another chance to act like hyper-sensitive juveniles and eternal victims. The Stroke Association disagrees with you in the strongest possible terms. Perhaps you’d like to take it up with that organisation? You stupid person, I watched my Mum have a massive stroke and then die 12hrs later. There was nothing funny about that! The Conservatives are not wanted in Scotland and if our English friends have got any balls they will bury this twisted bunch of no gooders once and for all. This shows what scum are running our fantastic country, Get them out. Let Nicola have a say, see the difference. This is almost certainly a troll account. Looking at the cache for the page it only had 30 followers, only started posting recently and the official one is https://twitter.com/rbkc which has over 5000 followers. Because obviously one person deciding this would be funny to post this on what has been shown to be a fake twitter account must INSTANTLY mean that the ENTIRE TORY PARTY THINKS LIKE THIS AAAGH THE HORROR OH NO. Do you really think that David Cameron gave this the personal go ahead? You’re all insane and also f***ing stupid. You must be a Tory, then. Look everyone – this is the kind of person who thinks we’re insane! Nobody was saying it was an official poster, if by that you mean one that was approved by Lynton Crosby. It was posted from a Conservative Party account, though – that has since been removed. Basically, it seems to have been Conservatives showing a complete lack of regard for other human beings. Of course Labour would never do something as sinister with an image of David Cameron. No, Labour wouldn’t. The image you highlight is nothing like as sinister. You should know perfectly well that the character Andy Pipkin from Little Britain has no need for a wheelchair, therefore there is no attempt to make William Hague look like a person who is genuinely disabled. If anything, Labour’s image shows a Conservative Party pretending to be something it is not. However, the comparison is poor, as Lou Todd was never aware that Andy was faking. The comparison the Telegraph attempted is also inaccurate, however, as Cameron’s son Ivan was indeed genuinely disabled. Can you prove that Labour was making a poor-taste comment on Cameron’s relationship with his own son in a poster that is about Cameron’s political affiliation, rather than his family? Of course you can’t. To be honest, I can’t prove what I have said either, but the evidence suggests I might be closer to the facts than you. The Tory-generated poster attacking Ed Miliband, however, most certainly is in the most extreme poor taste, as it makes a direct comparison between Ed Miliband and a stroke victim in what can only be seen as a deeply offensive insult to a very capable politician. Is if REALLY surprising that Tories in a safe seat drop all pretence of being human in public?